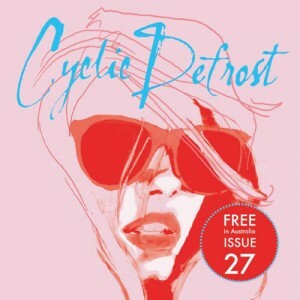 Cyclic Defrost has reviewed our recent free collaborative compilation ‘The Strain Of Origin – Feral Media vs LoFly’, noting that the album “represents something genuinely new amongst the Australian electronic music community”. Read the full review at cyclicdefrost.com. This entry was posted in Press and tagged cyclic defrost, lofly, the strain of origin on April 9, 2011 by Danny. 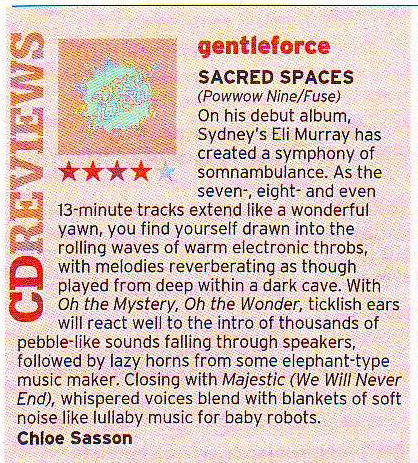 Feral Media’s GENTLEFORCE has scored a four star review in today’s Sydney Morning Herald, with the paper finding a novel way to describe his latest release, ‘Sacred Spaces’ – as “blankets of soft noise, like lullaby music for baby robots”. Read the full review below – and buy this release in limited CD packaging with free digital download at our online store. This entry was posted in Press, Releases and tagged gentleforce, reviews, sydney morning herald on June 4, 2010 by Danny.